Quality ingredients and a frisky wine list elevate the dining experience at this Buckhead institution. 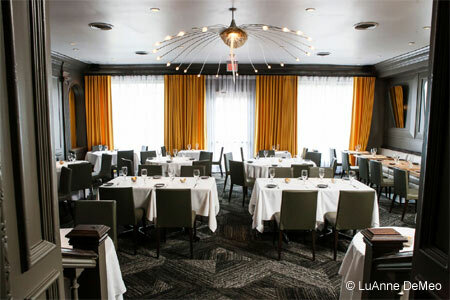 : Aria relies on pristine and often local and regional ingredients to compose its refined fare. On our last visit, we most enjoyed the soft-shell crab, a large buster that tasted fresh and sweet and offered a fine, firm texture. Lightly crisped, it rode a bed of Asian-inspired slaw. Aria also does a good job with sea scallops, sweet and translucent in the center, and foie gras among the appetizers. Dry-aged steak from Southeast Family Farms in Alabama was grilled exactly as ordered to enhance its deep, beefy flavor, which stood up to the green peppercorn bourbon sauce. Duck breast, however, disappointed, as it lacked flavor despite being appropriately cooked just to the pink state because it seemed under-seasoned. Accompanying farro and the Southern spring Appalachian ramps paired with the dish did much to lift the whole experience. The extensive and challenging wine list is among the city's best, and by the glass and half-bottle list choices complement the food. The Sylvaner we selected for the soft-shell crab was an ideal match. A by-the-glass wine order is treated respectfully, and the patron sees the bottle from which his selection comes. Desserts change often, guided by pastry chef Kathryn King, who makes her own ice creams. Chocolate espresso cake with almond toffee ice cream, while rich and deeply flavored, was not as frisky and edgy in concept as some we've savored in the past and what we’ve come to expect from this ingenious pastry chef.